The Weller soldering Tip for the Weller WSP80 Soldering Pencil Iron is solid copper plated with iron all over, and features nickel and chromium behind the working surface to provide maximum heat transfer from the heater to the tip. Each tip is individually bagged. 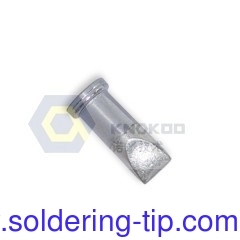 Soldering Tips for Soldering irons WP 80, WSP 80,MPR 80 and FE 75, TCP-Soldering irons Soldering tips of the LT series fit with the adapter to soldering iron LR 21. 18.Good combination quality and high hardness surface make low phosphorus plating excellent in wear resistance.